Much more worrying are problems such as the massive (measured by tens of thousands) emigration of Kosovo-Metochia ethnic Albanians towards western countries; example: armed clash in May in Kumanovo, between ethnic Albanian terrorists and Macedonian police, leaving dozens of fatalities; Macedonia arresting numerous ISIS activists in August, yet unable to root-out terrorist camps on its territory; Serb-Croatian and Serb-Muslim tensions in Bosnia-Herzegovina; thousands of Middle-Eastern and Central-Asian (mostly Syrian, Iraqi and Afghan) refugees crossing across the Balkans in pursuit of happiness—or just bare survival—somewhere in western Europe; links of conflicts in Ukraine and Middle East to the Balkans; new energy and transport routes as sources of tensions… The list just goes on. In other (non-Yugoslav) parts of the Peninsula things are also getting warmed up and cooled down in waves. Greek crisis seems to be delayed for a while, yet nothing seems to be finished. It appears, however, that besides the internal reasons, these new tensions have their origins in the centres of power far away from the Balkans, as was the case so many times in the Peninsula’s history. In this article I will explain why I think so. The approaching of 11 July 2015 meant that Bosnian and regional political were to be occupied on another Srebrenica anniversary. In 1995 the Serbian army (Serbian entity of Bosnia-Herzegovina) took the Muslim enclave in eastern Bosnia. Srebrenica was a UN protected zone, yet also a stronghold of Naser Orić, a notorious local warlord and criminal (both war and peacetime). Despite treaties between Serbs, UN and Muslims, he constantly went from the town and massacred Serbs in villages surrounding the enclave between 1992 and 1995. The death toll of these raids is at least 3287 Serbs . Just weeks before Serb forces entered the enclave finally, Orić and his top thugs abandoned it by helicopter for the safety of Sarajevo. The Serbian offensive resulted in many combat casualties among Muslim soldiers who defended their position and while attempting to cross Serb-held territory under combat, to reach Muslim-held territory in central Bosnia. In addition, many Muslim POWs were executed. The question regarding who ordered the executions has stayed unclear even after a series of processes at The Hague War Crimes Tribunal (ICTY), as there was no evidence that the Republika Srpska Army command gave such orders. Disputed is also the overall number of Muslim soldiers who died in July 1995. The official Bosnian Muslim leadership and the political West (US, UK and the Netherlands in the first place) insist on labelling events as genocide. This anniversary usually means that the tensions between Serbs and Muslims get heated in Bosnia, but the tensions this year were higher then ever. The reason for this was that the British proposal of UN Security Council resolution that would brand Srebrenica as genocide has forbid the labelling of that narrative as ‘genocide denial’ and in effect labels Serbs as a ‘genocide nation’. The resolution never passed Russia’s “veto”, but the debate about it heavily damaged relations between the communities. One of its effects was (in the contest of current geopolitical standoff between the West and Russia) supposed to contain the Serbs whom the UK views as the exponents of Russia in southern Europe and Mediterranean. Having this in mind, the main goal of the resolution was to brand the Serbian republic a ‘genocide state’, which was to be used as a prelude for the revision of the 1995 Dayton Peace Agreement and for centralising Bosnia-Herzegovina at the expense of Serbs. Without their state, Serbs would be completely deprived of their rights, which would in effect move Bosnia back to 1992, reinstating the casus belli. The commemorational ceremony in Srebrenica happened after the resolution has failed and turned out to become a major international scandal. Trying to calm the tensions, but also to please the western countries who supported his rise to power, Serbian PM Alexander Vucić went to the ceremony, but after it ended he was nearly lynched by an organised Bosnian Muslim mob. It remains unclear if this was only supposed to be a ‘message’ or really a murder attempt, but tomorrow morning Serbian tabloid Alo named a supposed MI6 operative on their cover page , blaming him directly for a murder attempt that was supposed to be a provocation that would ‘burn down the Balkans’. The tabloid went so far to connect the British operative with the 2003 assassination of Serbian PM Zoran Đinđić. This meant that the ‘political honeymoon’ between Vučić and the UK abruptly ended. Not long after that Tony Blair ceased being one of Vučić’s advisors . The second half of the drama was painted with the message of peace that Vučić sent by hosting member of the collective Presidium of Bosnia-Herzegovina Bakir Izetbegovic (Muslim), Dragan Čović (Croat) and Mladen Ivanić (Serb). Although the whole scene was very kitsch, in general this turned out a good move of Serbian PM, as it actually did ease the high emotional tensions that were very explosive potentially. The response to all of this by Republika Srpska President Milorad Dodik was to call a referendum to restore judicial powers vested to Republika Srpska by the Dayton Agreement, but stripped off by the so-called High Representatives of the international community, in effect the colonial-type viceroys of the political West. Dodik’s initiative was backed by Russia, which meant that Russia raised the stakes and adequately responded to the British challenge. Vučić previously politely suggested to Dodik to ‘rethink’ the decision already made by the parliament of Republika Srpska. However, after Russia supported the referendum, I doubt that Vučić was to oppose the referendum publicly, as this would be viewed badly by his own voters. Most of his supporters are fond both of Russia and especially of Russia’s firm position on defending the Serbian interest and their own obligations towards the Dayton Agreement (as Russia is one of the guaranties of the peace treaty). But even more relevant is that Vučić’s voters are fond of Dodik, whom they see as an independent brave Serbian voice in the Balkans. The behaviour of the Serb leadership under President Dodik is absolutely rational, however it is only such because the Serb leadership is forced to behave like this in the circumstances where the Bosnian Muslim leadership is both NATO oriented, and leaning towards Islamist religious extremism. The ties of Bakir Izetbegović’s father Alija with the jihadists are well known. The first Islamist militia on European soil was the notorious El Mujaheed Brigade of jihadist volunteers fighting for Bosnian Muslims during the Yugoslav Civil War. Izetbegović Junior has excellent ties with Turkey and Saudi Arabia, and many young Bosnian Salafists fight in the ranks of ISIS, Al-Nusra Front and other extreme groups in Syria. Needles to say that both Turkish President Recep Tayyip Erdoğan and PM Ahmet Davutoğlu—in the spirit of Neo-Ottomanism—repeatedly gave threatening statements on Bosnia-Herzegovina. They implied Turkey would militarily interfere against the Serbs if needed, which is not to be taken lightly having in mind that now the Turkish air force is engaged in bombing Kurdish positions in Syria which essentially allied Turkey with ISIS, it is an ‘open secret’ for already some time. Nevertheless, in spite of the extremism of the Wahhabi sect in Bosnia they comprise from 5% to maximum 10% of the overall Bosnian Muslim population, while the vast majority of Bosnian Muslims are secular. The voice of the moderates who support peace and cooperation with Serbs and offer alternative narratives to both the past events and current processes in the Balkans are however silenced both by the official Muslim elite and media, but also by the Western discourse constantly produced in the media, which serves to maintain a constant state of tensions between Serbs and Bosnian Muslims. Otherwise Serbs (Orthodox Christians) and Bosnian Muslims should be natural allies, as they are both essentially the same people, divided by faith as a result of historical circumstances. Furthermore, in the eyes of the West, both are in essence ‘Oriental’, so their cultures intertwine once again, having the historical civilisation centre in Constantinople. The 1992-1995 war in Bosnia-Herzegovina showed that such cooperation is quite possible when not interrupted from outside, as in the case of Serbs-Muslims coalition of the so-called Republic of Western Bosnia centred in the town of Velika Kladuša, led by Bosnian Muslim leader Fikret Abdić who disagreed with US-backed Alija Izetbegović’s intolerant policies. Unfortunately, such cooperation was rarely seen as it did not fit the outside forces’ interests, in the most current case the UK that geopolitically manipulates the hostilities and tries to fuel another conflict. It is well known that Croatian nationalism is a neglecting type of nationalism. It is actually defined through negation of another identity. For a Croatian nationalist, the first thing they want to make clear is that they are not Serbian. Everything rest is secondary and derived out of that first principle. This of course has its origins in history that is not as ancient as often presented. 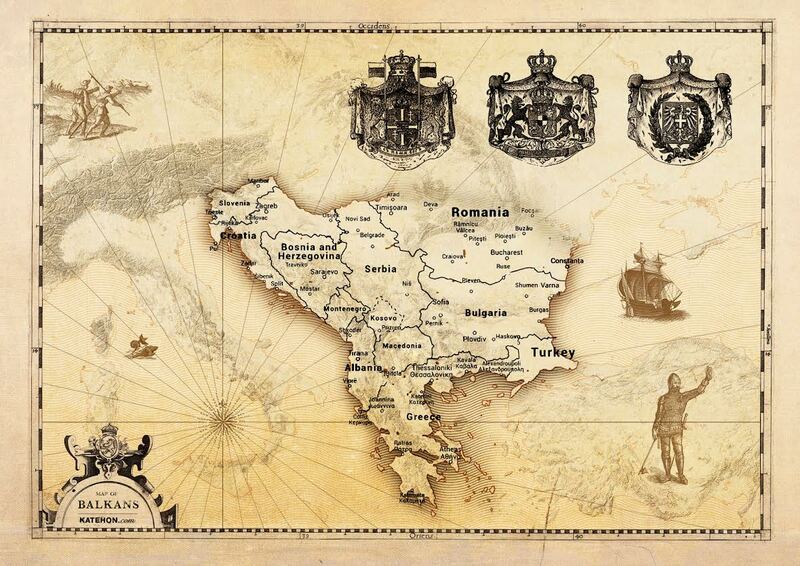 From the beginning of the 19th century and the process of the formation of the Serbian state, the Habsburg Empire felt the danger that all the Serbian speakers might thrive to join the newly formed state. Many of these people were living in the Empire’s border areas, which represented a real security threat. With the help of Vatican and a circle of intellectuals (both clerical and secular) the Black-Yellow Monarchy decided to implant a new identity into the masses of Serbian-speaking Roman Catholics. This is why the identity of the Serbian-speaking Balkan peoples started to be defined on the basis of religion, not language as it was the case for most other European nations, such as Germans. That is why the modern Croatian identity was based on a negative mirror identity. This case is far from being unique. Similar was with the British Empire that facilitated the partition of India to secure the division and paralyse the potential rise of their former colony into a major power. Today we have India and Pakistan (as Anti-India). The same might come out with Ukraine (as Anti-Russia) if it remains an independent state, as it is today, after the war ends. Coming back to the present day, August began with another anniversary. Croatia celebrates the 20th anniversary of ‘operation Storm’ on 5 August 2015. that was a major offensive of the Croatian forces trained by the Military Professional Resources Inc. (MPRI), a private US mercenary company with strong ties to the Pentagon. The operation was a military attack against the Republic of Serbian Krajina which was (just like Srebrenica) a UN-protected zone, even some UN troops wee killed by Croatian army during the attack . The US was directly involved as their warplanes bombed Serbian air defence, radar and communication facilities , thus allowing Croatian air force to bomb Serbian refugee convoys. The attack was utterly illegal from the point of international treaties, yet backed by the US, who’s Ambassador Peter Galbraith personally joined in riding a Croatian tank. The result of the operation was that several thousand Serbian civilians were massacred by Croatian troops, while almost quarter of a million Serbs were ethnically cleansed from their ancestral lands and forced to flee for safety in Republika Srpska or the Federal Republic of Yugoslavia (today Serbia and Montenegro). To commemorate the ‘victory day’, Croatia organised a military parade and events all over the country, while the leaderships of Republika Srpska and Serbia decided to commemorate it as a day of sorrow. The celebration in Croatia was fallowed by an outburst of WW2 Nazi symbolism (from flags, hate songs and WW2 Croatian Ustashe uniforms, to Nazi salutes) glorifying the genocide committed by the so-called Independent State of Croatia (Nazi puppet state in occupied and dismembered Yugoslavia) upon the Serbs. This should not surprise knowing the nature of the anti-Serb sentiment is a necessary integral part of modern Croatian nationalism. Having in mind the 9 May ethnic Albanian terrorist attacks in Macedonia and a jihadist attack on a police station in Zvornik (east Bosnia), all these events combined show that tensions arise in the ex-Yugoslav space. This most recent wave of animosities in ex-Yugoslav space seems to be coming out of nowhere. Although the bad feelings did not go away, the new clashes seem to be produced from abroad and controlled for the time being. One thing is already clear, that none of the Yugoslav banana republics are ready for war. Primarily - because they have been heavily de-industrialised and demilitarised in post-war years. Even gravelly weakened by ‘reforms and professionalisation’, Serbian army remains a dominant military power in the post-Yugoslav realm, while the Serbian question remains the central question in the Balkans. Frustrations are high on all sides, but it still seems that only solely internal forces did not provoke the wave, which is why the British failed attempt for a UN resolution on Srebrenica and recent parade in Zagreb seem to be coming from the same kitchen. These Balkan skirmishes seem to be a part of a much greater picture. The Russia-West proxy war in Ukraine might be part of the answer, but the real answer lies in the shift the US is making globally – by leaving the Middle East and concentrating on the Pacific to contain China. It should be sad that Ukrainian conflict is also somehow connected to the Balkans. The overwhelming majority of Serbs support the Russian population in Ukraine and Croats in general support the other side. This is why many Serb volunteers fight in the ranks of the pro-Russian militias, whereas some Croat Neo-Nazis joined the Azov battalion. Knowing that many Islamists from the Balkans fight in the ranks of ISIS and other groups in the Middle East, it seems that the response of the peoples in the region to the world crisis is very Huntingtonian. Both Turkey and Saudi Arabia are in a grave danger now. It could even be said that both are in a danger of decomposition in the nearest future, in the Syrian-Iraqi style, though time will only tell how much stamina they have. At the same time, their main regional adversary - Iran is in a geopolitical growth and may rise as the main regional power, as the result of the wars in Syria, Iraq and Yemen which are all are proxy wars of Turkey, Saudi and other minor Sunni Muslim courtiers against the Shia Iran. The Iranian nuclear deal of Vienna will show its results in the near future, so it remains to be seen if Persia will cooperate with the US on the expense of Turkey and Saudi Arabia, but also on the expense of their own ties with their ally Bashar Assad, as French Middle East expert Thierry Meyssan suggests. So, what is the connection with the Balkans? All three of these sides have supported the Bosnian Muslims during the 1990-ies wars in Bosnia-Herzegovina and all were sending arms, money and fighters to Alija Izetbegović in the name of the Muslim cause. It seems, however, that Iranians have regretted, as the Bosnian Sunni Muslim leadership gave much more influence to Turkey and Saudi Arabia after the war. Furthermore, the Muslim leadership of Bosnia and Herzegovina, now headed by Bakir Izetbegović (Alija’s son) made some directly anti-Iranian moves. They have voted for a UN resolution that was condemning Syria (Iran’s greatest friend in the Middle East), which was logically seen as a treason in the eyes of Teheran. Regardless of the obvious rise of their regional influence, Iran can hardly take the leading role among the Balkan Muslims, for a simple fact that most of them are Sunnis and Turkophiles. Yet the shift of power in the Middle East will in one way or another influence the relations in more remote regions with Muslim populations such as the Balkan Peninsula. The danger is ever more serious if Turkey gets more frustrated and desperate and tries to gain some success in the Balkans to compensate for defeats in the Middle East. This goes for Saudi Arabia too. China bought the largest cargo terminal at the port of Piraeus and plans to construct a fast railway to connect it with the heart of Europe – through Skoplje, Belgrade and Budapest. Russia wants to do the same with its Turkish stream gas pipeline through Greece, Macedonia, Serbia, Hungary with final destination in Austria. These facts offer an obvious answer why we can see the new wave of destabilisation in the Balkans. Germany is not opposing these projects, as they would strengthen their energy security and supply of goods. The US on the other hand was and still is the dominant foreign power influencing external and internal politics of the Balkan ‘banana republics’, so they certainly are not happy about these projects. Both of these grand constructing projects provide a unique historical opportunity for the Serbs and Hungarians to find a firm common interest which would be a great opportunity for a long standing stability and cooperation between the two peoples and countries with a troubled bilateral history. They would also connect all the countries on their path and secure peace and economic stability for a foreseeable future. But instead of this, we can see all these countries being sent on a path of instability. This region is only a fragment of a picture that starts in the Middle East. The story starts in 2001 when the US started the war in Afghanistan and later in Iraq, which left their greatest regional foe Iran victorious, establishing a local hegemony. Another defeat for the US was the so-called Arab Spring that essentially deprived the US from the control over the Suez Canal. In Egypt they supported Mohamed Morsi of the Muslim Brotherhood against their old ally Hosni Mubarak, but at the end the military junta led by Field Marshal Abdel Fattah el-Sisi is turned out to be Nasserist and it started cooperation with Russia very soon after the coup d’etat. One wise thing the US did was not to repeat the Franco-British fiasco of 1956 and enter another disastrous war. The Balkan construction projects—especially the fast railway as part of the Chinese ‘New Silk Road’—are directly connected to the current battle for the trade chokepoints in the Middle East: Suez Canal, Hormuz Straits and Bab-el-Mandeb (The Gates of Tears). If the Suez Canal or Bab-el-Mandeb is closed for even a short period, then what is the purpose of the Piraeus port for China ? None. “Chinese are switching to the global commodities position, and that switch is the imperial switch,” said British historian Niall Ferguson. This Chinese ‘switch’ makes the US move its focus towards the Pacific, in the process trying to leave chaos behind in the Middle East and elsewhere in Eurasia including the Balkans. This is also the reason why we can see the navies of all major powers including China and Russia in and around these chokepoints. The US is leaving the Middle East. It is gaining energy independence by developing fracking and containing China becomes a goal above all others. US President Barack Obama said this explicitly in his statement about concentrating of the US focus from the Middle East to the Pacific . This leaves an open space for Russia. We have seen recently that the Ministers of Foreign Affairs of two fierce regional rivals Saudi Arabia and Iran visited Moscow in a short period of time. The sudden change of attitude towards Russia among the absolutist monarchies of the Persian Gulf also shows that the Wahhabi monarchs realised that ISIS, the monster they created in Syria and Iraq, can easily collect their royal heads too. After all, the fate of former Western allies Hosni Mubarak and Muammar Gaddafi tells more then a thousand words. The main US goal in the Balkans is similar to the goal they had in Germany after the WW2 – to keep the EU in, the Serbs down and Russia out for as long as possible, but all of this without the a ‘Marshal Plan 2’ to secure economic prosperity in the region, quite the opposite. The US is well aware this policy cannot be successful forever. The Russians should do just the opposite if they want to enlarge their share of influence in the region, and the best way to do so is to strengthen the Serb factor – being both central and Russophile. Belgrade—as many other Balkan cities—is witnessing a very new and surreal scene. The city parks around the central bus and railway stations are full of unfortunate travellers who walked their way on foot, trains, sea and by any means possible, to reach the Serbian capital and to continue their journey to Hungarian border and then further westward to the ‘lands of opportunity’. The vast majority of these people are not economic, but war migrants – refugees who fled the warzones of Syria, Iraq, Afghanistan, Libya, all inflamed by the US, NATO and their ad-hoc formed ‘coalitions of the willing’. The Balkan countries that have been hit the most by this wave are Greece, Bulgaria, Macedonia and Serbia. The migrants reach Bulgaria trough Turkey from which the road leads them trough Bulgarian Trace Valley to Serbia. Another—much bigger—route goes trough Greek islands onward through Macedonian Vardar Valley and Morava Valley in Serbia, from which they try to enter Hungary (or Croatia, in a rarer case). This flood of migrants raises new questions in already troubled societies. The press and numerous experts and commentators speculate that ISIS members might be infiltrated into the masses of refugees. The fear is even more fuelled by several threatening videos of ISIS that call for the attacks on Serbia, Croatia and so forth in order of spreading the ‘Caliphate’ westward. This is not a naïve threat, knowing that many Balkan nationals—especially from Bosnia-Herzegovina and from NATO-occupied Serbian province of Kossovo-Metochia—fight and many have already been killed in the ranks of the extremist organisations in Syria and Iraq. Also the terrorist attack in April 2015 on a Republika Srpska police station was perpetrated by a local claimed to be associated with the Islamists. Some experts fear that in the event of the Muslim-Serb conflict, ‘sleepers’ hidden among the migrants might spread terror in major cities and join the fight in the regions of the Balkans (Bosnia, Macedonia, Kossovo-Metochia, southwest and southeast Serbia) that might be lit up in a hypothetical future war. Russian expert for the Balkans Elena Guskova claims this war may start as early as late-August . The potential conflicts are with the Albanian factor (Albania plus their population in the region) or the Bosnian Muslims if this fits the interests of the US. This should certainly not be taken without caution in the light of the US Secretary of State John Kerrie’s statement about the ‘line of fire’ between Russia and the West, where he directly named a number of Balkan states. Another aspect of the problem is that Hungary started building a wire fence along the border with Serbia, as well as media speculations that Serbia and Macedonia should build refugee camps to host hundreds of thousands of refugees, and that the Western countries might send the refugees back not to their countries of origin, but to the first non-EU country they’ve entered before entering the Union. While these may well be mere sensationalist media speculations and orientalist xenophobic scaremongering, the end of the refugee crisis is not foreseeable. Only time will tell how serious this problem can grow. The Balkans should be not viewed only as part of Europe, where it geographically belongs, but also a part of the Greater Middle East problems, and one of the key hotspots in the current world crisis and global shift of power. The US is retreating from the Middle East in general and moving politically and militarily to the Pacific to try to contain China. US strategy is therefore also to create conflicts everywhere it can along the borders of Eurasia. The outline of this process was bluntly given by John Kerry in his famous ‘countries on the line of fire’ remark. This is done by the retreating US to divide the continent and lock it in conflicts for as long as it can. In that way Eurasia cannot consolidate and its countries will not be able to establish new trade and energy routes, that would not be under the control of the US (or political West more broadly). As long as the US controls the main sea routes it will be the dominant world empire. It may be loosing the grip, but would certainly not want to let go without creating chaos before other powers of the emerging multi-polar world would take control. If they burst before managing to organise, even better, that is the logic of the US today. In pursuit of this, another goal seems to be a tendency of destroying classical nation states by creating civil unrest everywhere possible along the neuralgic points of Eurasia, the ‘Arab Spring’ that toppled down secular Arab nationalist autocracies and brought Mad Max-style chaos offers a proof for that. If the society is thrown down form the level of nation to the level of ethnic group or tribe, unorganised in a classical nation state manner, it is easier to be manipulated with and it becomes locked in conflicts with others. We have seen this scenario unveil in Syria, Iraq and Yemen, but the worse case scenario took place in Libya and Somalia. All the mentioned disputes and recent geopolitical skirmishes and processes in the Balkans need to be viewed in thus perspective. American retreat from the Middle East towards the Pacific Ocean means that the influence of Russia is only likely to increase in the region (Middle East, South Caucasus and the Balkans), especially if Russia plays its cards well. This also means that the US may gradually retreat from its bases in Kossovo-Metochia and elsewhere in the Balkans, leaving a security gap and increasing a conflict potential. If Russia wants to benefit from this situation it should maximally support the Serbs in the Balkans to fulfil this security gap. By uniting the Serb space, it would do exactly the opposite from what the US and its European allies have been doing for the last 25 years. Serbs are located at the heart of the Balkan Peninsula and still being the largest people between Vienna and Constantinople, but also very vulnerable. They are surrounded by NATO and a bandwagon of traditional local enemies that could be activated with the help of US in any given moment. It should not come as a surprise if the US uses Hitler’s WW2 blueprint of occupying Serbian space by using local NATO countries to divide the terrain into occupying zones. Recent US military supplies to Bulgaria should not be seen unnoticed in this context, especially after Bulgarian PM Boyko Borisov’s threatening message to Macedonian PM Nikola Gruevski to resign. But not only did Borisov verbally attack Gruevski, he also sent Bulgarian army to the border with Macedonia. In the light of all of the above, I strongly believe Russia’s Balkan policy should be concentrated around finding the means to significantly support Serbia (politically, economically and militarily) as soon as possible, so that it can overcome this immensely challenging period. It should also be in support and help facilitate the aspiration of the Serbian people to reunite the Serb space in the future. This space is now divided into many failed state formations, but before all of this Russia should help preserve the bare existence of the Serb population in hostile countries and territories. Having in mind that the Serbs are the westernmost outpost of the Orthodox Christian-Slavonic world, by doing so Russia would largely increase its influence in the south of Europe and the Mediterranean. Many challenges, however, among which some are mentioned here, lie ahead this long and wiggly road.